Plitheon was a dragon-like Bakugan, and was the Guardian Bakugan of Jesse Glenn. Plitheon is part of Jesse's team and a cool outlaw. A vicious fighter, there is no battle angle in which he will not need to attain victory. His fighting style is strong and stalwart and he uses unusual battle plans to maintain his aggression and beat down his opponent's. His main Battle gear is Vilantor Gear. Plitheon was released in Wave 3. It was also be one of the Bakugan to break the current 830 G power limit. As of now a Ventus one has 850G. A Haos Plitheon has 840 Gs, a Pyrus Plitheon has 770 Gs, and a Subterra Plitheon has 650 Gs. It's actual form resembles a mixture of Hawktor and Helix Dragonoid. His ball form resembles Strikeflier. 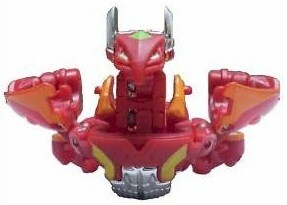 Plitheon is part of the BakuMetalix series of Core Bakugan along with Lumino Dragonoid and Phosphos. Purchase your Plitheon Bakugan from Amazon now!